Yoga retreats at Muskoka Soul. Fortunate retreat leaders choose Muskoka Soul as their destination. Many hosts have been co-hosting with us for over 10 years. 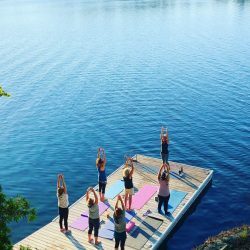 Read why in this blog, on bringing your wellness retreat to life at Muskoka Soul. Are you looking to attend an event, see the upcoming retreats which are held in the spring, fall & winter. You will find in these seasons yoga/ wellness / creative / art / writing / fitness / cycling 2-5 day programs on weekends and mid-week. Annually retreat leaders from across Ontario host wellness events at Muskoka Soul. Happy to secure your spot! Securing your spot is easy, select the event you are interested in attending and send us an e-mail about event you wish to attend. Alternatively if you wish to be notified about events, contact us. Retreat leaders planning to host an event, we would love to work with you. You supported in 3 ways to create buzz and promote your Brand. 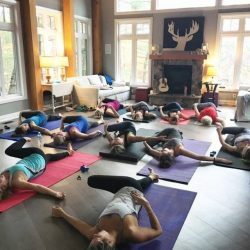 Muskoka Soul collaborates with retreat hosts. So not only do we promo your retreat, we also secure your retreat attendee through our website. This service aligns to the Travel Industry Council of Ontario rules on who can take payment for accommodation for retreats. Rates for retreat programs are set by you the retreat host and you designed the program, plan the food service and retreat offering. Use our sample itinerary to kick start your planning. Consider area activities to add to your plan. See the amenities and space at each of our properties. Once ready, to secure your spot for a retreat a deposit payment is required and payable through our Muskoka Soul management company Soul Management Group Inc. Retreat hosts further benefit beyond promotion of your retreat through making your attendee costs desirable and reasonable. Decide on all retreat costs. Unlike Ontario Retreat locations you manage the food cost by creating the food for your retreat or booking catering through a local supplier. As a result of our offering save more than $75/ person, like administration costs. For your attendees to secure their accommodations the costs are reasonable. Plus you decide on food cost and any services you wish to offer. As well as book at the rate charged by the supplier you use, eg. RMT, Yoga Instructor, Boating Experience. When you booked with Muskoka Soul we e-Connect our retreat hosts and no Concierge or Property Manager fee applies. 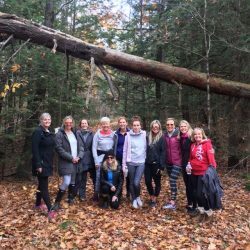 Read our blog where retreat leaders share their experience at Muskoka Soul and why retreating is an important part of the services they offer their clients. See our reviews on what guests are saying about Muskoka Soul. Ready to secure your retreat dates, lets talk & build business together! Step 1: Secure your retreat dates through an agreement & deposit payment. Step 2: Offer registration, we build a secure gSheet registration system to track participant registration. Step 3: Design your retreat program & inform participants how they can register for your retreat. Step 4: Share your retreat program, we can post on our site, co-promo & e-connect interested parties. Step 5: Have a successful & profitable retreat event. Book a second in a less than a 12 month period and benefit from a lower accommodation rate.